RETIREMENT SALE - 50% OFF! NOTE: You will still have access to the course classrooms on my site and can work at your own pace. This course will just not be available for purchase after June 10. Imagine opening your mailbox and finding a splash of color and pattern. This is no ordinary envelope! You pull it out to reveal a work of whimsy and art sent by someone who clearly holds you dear. In my largest and most requested class, we will explore Art That Travels. 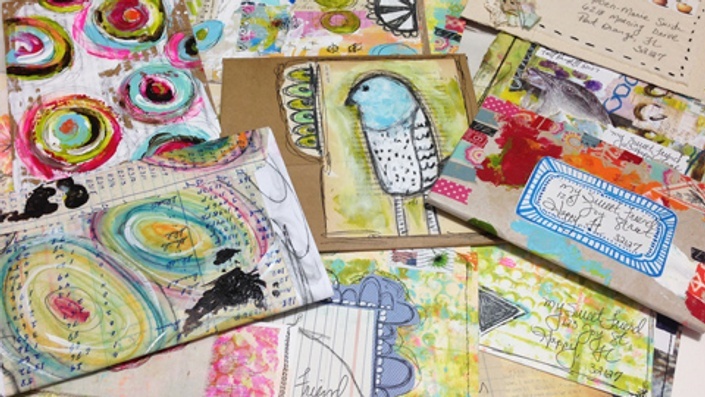 From a quick anytime project to mail art that transforms into a hidden gift, we will create fifteen pieces of art requiring postage. This workshop is improvisational and free spirited…with a more non-linear approach. You will see my entire process while I "think" through steps and change my mind and direction as new ideas come. Be inspired by file folders, fabric, recyclables, paint, photos, envelopes, catalogs, patterned paper and cardboard in wildly inventive ways. You will never look at mail the same way and you may never send another naked envelope again! Join me in this MEGA class containing 18+ videos, painty project downloads I have created just for you, and inspiring links. You will soon be creating joyful moments at mail boxes all over your corner of the world! This workshop is completely self-paced - you decide when you start and when you finish. All workshop content is available to you when you register. How does lifetime access sound? After enrolling, you have unlimited access to this course for as long as you like. Can I watch the videos on my iPad or smartphone and are they downloadable? The tuition is non-refundable once access has been given to registrants. One student per purchase. No splitting/sharing classes, please! This workshop is not open for enrollment. A comprehensive list with links, sizes, etc. will be provided once you register. Pencil, Two security envelopes, Scrap paper, Oil or wax pastels, Text weight papers, Wax linen thread, Bookbinding needle, Book awl/paper piercer, Ruler, One piece of cardboard, One used food package of your choice, Stabilo Marks All Pencil or other pencil of choice, Cheap hairspray, A few pages from an old book, Stapler, Sticky back velcro, Small strip of fabric, Black crayon or oil or wax pastel, Gel medium, 12” x 12” plastic sheet protector, Old letter or pieces of old book paper, a few pieces of old book paper or other ephemera, Paper Crafting Flowers, Two medium/large wax bags - I used cereal/cracker bags, Double-sided tape, Pretty napkins, papers and other pretty things to put into your mail art piece, 1 - 12” x 12” piece of scrapbook paper, Little pieces of scrap paper, Catalog of choice - I used one from Anthropologie, Masking tape, Photocopy of a piece of your artwork, Two labels of choice, Fabric strips, Catalog envelope, One piece of duck cloth/unprimed canvas, Piece of cotton muslin, Scrap of fabric and lace piece, Black embroidery thread, Embroidery needle, Strip of fabric, Sewing machine, One piece of coordinating fabric of your choice, A few stencils, Spray inks, Big tag and Ribbon.